Summertime brings so many opportunities for fun and adventure. Even the clouds in the sky are lighter and happier than during the winter months. And being from Western NY, any time it's not snowing is a cause for celebration! But, summer also brings the need to shed the layers of clothing which protect us from the cold. Unless you are like me. You see, I have Sjogren's syndrome and MCTD. Both are autoimmune conditions in which the body attacks itself and both are affected by being exposed to sunlight. In the case of Sjogren’s, being in the sun can cause a flare up. Flare ups are the last thing you want to trigger when you have an autoimmune disorder. They are the process during which the disease attacks and damages the body. And they hurt. A lot. So for me, sunlight is a no-no. But living completely indoors is difficult. We all have to go out sometimes. And who really wants to live without fresh air and nature? I need to be outdoors near greenery or listening to the sounds of water and waves. So how do I indulge my love of nature while still protecting myself from the effects of my disease? Quite simply, I cover up. Head to toe. And that can end up making me look more like a Bedouin than someone from suburban Rochester. But it’s necessary. So I do what I need to do and ignore the stares. Tank tops. Usually that cotton jersey material we all associate with men’s undershirts. I have a rainbow assortment. They cover what they need to cover and can be worn with everything. There are even tanks covered completely with sequins to be worn on a night out. These are a staple in my wardrobe because my body doesn’t regulate it’s own temperature. (It's really NOT Menopause!) Having the ability to literally take my shirt off to cool down and allow a breeze to hit my skin is a must. Gauze shirts. That wispy lightweight material that can cover me up but still allow air to flow through the loose weave. These cover ups must be long sleeved. (And I am very tall. It's not easy finding sleeves long enough to cover my entire arm.) Any color gauze will do but my favorites are white, pale pink, and light blue. They reflect sunlight make me feel pretty. Paired with a tank top, I can completely cover my upper body with material that won't trap heat and trigger a heat-related episode or extreme sweating-two big problems for anyone with Sjogren’s. Gauze again. But for the legs. Jeans are HOT! So I have invested in several pairs of gauze/linen pants. Being summer, pedal pushers and capris are always in style so I don't have as much of a problem fitting my long legs. I tend towards darker colors for my bottom half. I am becoming more confident in my body, but I don’t know any woman who would actually cover their behind with loose, flowy white material unless she's getting married! More gauze. This is the piece that causes the majority of stares and commebts, but I have found it to be the most important of all. I have dubbed it my “Sun Shroud”. 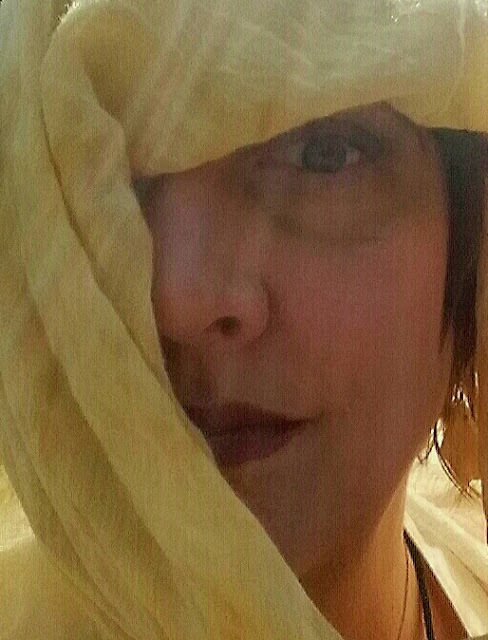 Nothing more than a lightweight cotton or gauze sarong, I use it to cover my head, neck, and chest- especially when driving. I want to point out that it is obvious to most people to cover up when in direct sunlight. But I learned the hard way that the sunlight that comes through windows, specifically car windows, can be harder on my body than just the rays I catch walking in the park due to being more intense. So I devised my shrouds. They have to be long enough to stretch from one hand to the other over my shoulders or if my head is wrapped (think Tina Fey in Whiskey Tango Foxtrot) they need to cover down to my fingertips. This way, I can wear them alone over a tank top if I so choose and still be totally covered. An umbrella. I carry one all summer long. I was that mom at Little League no one wanted to sit behind. But sometimes, the sun is so bad that I need the extra protection an umbrella gives by allowing me to always walk or sit in a shadow. I have had 20 years to perfect my anti-sun wardrobe and to figure out which styles and fabrics work best for me. I stick to this ensemble whenever the sun is out. In fact, I have now developed a loose, breezy, southwestern style year round that has evolved from my medical needs. It serves me well. And I am comfortable in it. Even when I catch people staring. I see those stares as being complements. After all, I’m 6’1”, and I'm stylish. Who wouldn't notice that?